Phoenix Models: one limited edition collectable, die-cast airliner model in a 1/400th scale of a Boeing B747-867F/SCD in the Cathay Pacific Cargo Airways Current Colors Scheme. With 100th Logo. Airframe Registration B-LJC. This model is constructed of die-cast metal with some plastic parts. The product was released in December, 2015. Phoenix Models: one limited edition collectable, die-cast metal airliner model in a 1/400th scale of a Douglas DC-9-32 in the Cebu Pacific Airlines Blue Fish Colors Scheme. Airframe Registration RP-C1509. This model is constructed of die-cast metal with some plastic parts. This product is available beginning in August 2003. Phoenix Models: one limited edition collectable, die-cast metal airliner model in a 1/400th scale of an Airbus A330-302 in the China Airlines Special Fruit Sweet Color Scheme. Airframe Registration B-18311. This model is constructed of die-cast metal with some plastic parts. This product is available beginning in July 2006. Phoenix Models: one limited edition collectable, die-cast metal airliner model in a 1/400th scale of a Boeing B777-309/ER in the China Airlines Special Spirit of Seattle Color Scheme. Registration B-18007. This model is constructed of die-cast metal with some plastic parts. This product is available beginning in July 2016. Phoenix Models: one limited edition collectable, die-cast airliner model in a 1/400th scale of an Airbus A330-343 in the China Eastern Airlines Logo jet �Chinese News website people.cn� Color Scheme. Airframe Registration B-6126. This model is constructed of die-cast metal with some plastic parts. This product is available beginning in August, 2015. Phoenix Models: one limited edition collectable, die-cast metal airliner model in a 1/400th scale of an Airbus A330-343 in the China Eastern Airlines Special Toy Story Colors Scheme. Airframe Registration B-5976. This model is constructed of die-cast metal with some plastic parts. This product is available beginning in July 2018. Phoenix Models: one limited edition, collectible die cast airliner model in 1/400th scale of an Airbus A330-223 in the China Southern Airlines Current ?SkyTeam? Colors. Airframe Registration B-6528. The model is constructed of die-cast metal molded with some plastic parts. This product was released in July, 2011. Phoenix Models: one limited edition collectable, die-cast airliner models in a 1/400th scale of a Boeing B777-31B/ER in the China Southern Airlines Current Colors. Airframe Registrations B-2099. This model is constructed of die-cast metal with some plastic parts. This product is available beginning in February, 2014. Phoenix Models: one limited edition collectable, die-cast metal airliner model in a 1/400th scale of a Boeing B787-9 Dreamliner in the China Southern Airlines Current Delivery Colors Scheme. Airframe Registration B-1242. This model is constructed of die-cast metal with some plastic parts. This product is available beginning in July 2018. Phoenix Models: one limited edition collectable, die-cast airliner model in a 1/400th scale of a Boeing B747-422 in the Corsair Intl. Airlines Current Color Scheme. Airframe Registration F-GTUI. This model is constructed of die-cast metal with some plastic parts. This product is available beginning in October, 2014. Phoenix Models: one limited edition, collectible die-cast metal airliner model in 1/400th scale of McDonnell Douglas MD-83 in the Crossair Airlines Special ?2000?s Congratulations Anja Parson? Colors. Also includes a metal numbered Collectors Card. Airframe Registrations HB-ISX. This model is constructed of die-cast metal, molded with some plastic parts. This product was released in Released March, 2003. Phoenix Models: one limited edition collectible, die cast airliner model, in a 1/400th scale of an Ilyushin IL-96-300 in the Cubana Airlines NEW 2017's Revised Mainline Colors Scheme. Airframe Registration CU-T1251. The model is constructed of metal with some plastic parts. This product was released in December, 2018. Phoenix Models: one limited edition collectable, die-cast metal airliner model in a 1/400th scale of a Ilyushin IL-96-300 in the Cubana Airlines Hybrid painted metal Aeroflot Colors Scheme. Airframe Registration CU-T1717. This model is constructed of die-cast metal with some plastic parts. This product is available beginning in May, 2018. Phoenix Models: one limited edition, die-cast airliner model in a 1/400th scale of an McDonnell Douglas DC-10-30F in the Das Air Cargo Airlines Late 1990’s Colors Scheme. With ANA Aviation Services Logos. Airframe Registration N400JR. This model is constructed of die-cast metal with some plastic parts. This product was released in Released in February, 2003. Phoenix Models: one limited edition collectable, die-cast military model in a 1/400th scale of a Boeing B777-36N/ER in the Ethiopian Airlines Current Colors. Airframe Registration ET-APX. This model is constructed of die-cast metal with some plastic parts. This product is available beginning in January, 2014. Phoenix Models: one limited edition collectible, die cast airliner model, in a 1/400th scale of a Boeing B787-10 Dreamliner in the Etihad Airways NEW Mainline Colors Scheme. Airframe Registration A6-BMA. The model is constructed of metal with some plastic parts. This product was released in December, 2018. Phoenix Models: one limited edition collectible, fully assembled, and highly detailed die cast airliner model, in a 1/400th scale of a Boeing B787-9 Dreamliner in the Etihad Airways Special 2018 Formula One (F-1) Colors Scheme. Airframe Registration A6-BLV. The model is constructed of die-cast metal with some plastic parts. This is a collectable model, not suitable for children under the age of 14 years. This product was first released in January, 2019. 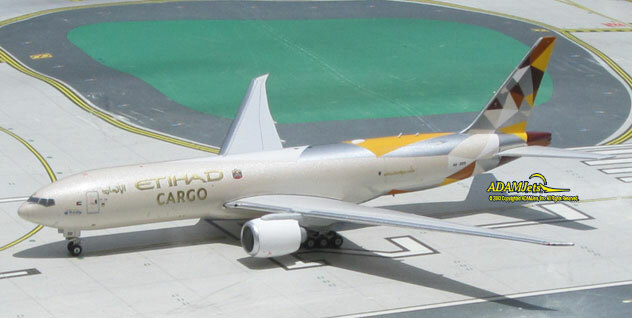 Phoenix Models: one limited edition collectable, die-cast metal airliner model in a 1/400th scale of a Boeing B777-FFX in the Etihad Cargo Airways NEW Colors Scheme. Airframe A6-DDD. This model is constructed of die-cast metal with some plastic parts. This product is available beginning in July, 2018. Phoenix Models: one limited edition, collectible molded plastic airliner model in 1/400th scale of an Boeing B767-35E/ER in the EVA Air Airlines Current Colors. Airframe Registration B-16605. The model is constructed of die-cast metal molded with some plastic parts. This product was released in October, 2011.